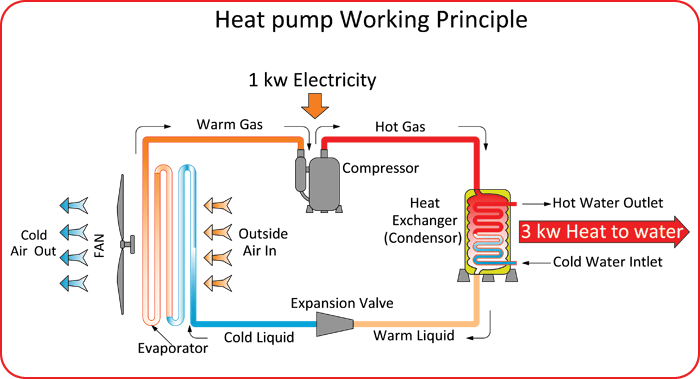 Heat Pumps as the name suggests, is a heating device that transfers heat from the source of heat to heat sink. Heat sink transfers the heat generated to a fluid medium. In a way, heat sink is a passive heat exchanger. Naturally, as is the case with any energy transmission, heat energy travels from a hot area to colder area. But with the aid of heat pumps, the heat from a cold surface can be absorbed and transferred to a warmer surface, making the warming the warmer surface hot. In heat pumps, most of the generated heat comes from the outside air. Only a fraction of the heat comes from the electrical energy. This makes the heat pumps very energy efficient. The Coefficient of performance (CoP) is very high for heat pumps when compared to other heating devices. The Coefficient of performance in a heat pump is the ratio of the heating capacity to the Rated power input. Typically a CoP above one is a good sign of energy efficiency. The Heat Pumps usually have a CoP above four. The heat pump has the following components. The function of the various components are briefly explained here with respect to heat pumps. Refrigerant is usually a fluid, but it undergoes various phase transmission from liquid to gas and then back to liquid. The transfer of a substance from its gaseous stage to liquid stage is done by the condenser. The evaporator transfers the substance from its liquid stage to gaseous stage. Thus its function is opposite to that of the condenser. The expansion valve decides the nature of the refrigerant that enters the evaporator. In a heat pump, the expansion valve changes the refrigerant changes to cold liquid from hot liquid. Stage 1: The refrigerant in its liquid stage moves through the evaporator and heat from the outside air forced through the refrigerant through the fan, making the refrigerant a warm gas. Stage 2: The warm refrigerant in its gas stage moves into the compressor. The compressor increases the pressure of the refrigerant and makes it a hot gas from warm gas. Stage 3: The hot gas travels through the condenser which is a heat exchanger. The water to the storage tank comes in contact with the condenser which has the hot gas. The heat is exchanged with the coldness in the cold / normal water that is flowing to the storage tank. Stage 4: The refrigerant cools down a bit because of the heat exchange with water to the storage tank. Therefore the refrigerant that comes out of the condenser gets converted to a warm liquid state from a hot gas state. Stage 5: The warm liquid refrigerant transfers to the expansion valve where it becomes a cold liquid. From there it goes to the evaporator and the entire cycle starts from stage 1. The heat absorbed from the air in the evaporator get exchanged with the coldness in the cold /normal water flowing to the storage tank until the desired temperature is reached. Once the desired temperature is reached, the operation stops. When the temperature of the water falls below the desired temperature the entire cycle starts again. As it is clear from the working principle, majority of the heat is absorbed from the air outside. This helps in achieving a higher energy efficiency. While conventional heaters have a Coefficient of performance of 1 i.e 1 KW of electricity is used to produce 1 KW of heat, heat pumps have a coefficient of performance of 4 i.e 1 KW of electricity is used to produce 4 KW of heat, thereby making it energy efficient.